The hotel is located close to the beach, which is really good! The buffet has a huge variety. Close to the beach. Good espresso coffee. Nice AC ventilation in the rooms. I like the fact that it was clean and really close to the beach. The bar guy was fantastic at pouring out unlimited whisky for us, and always made us smile with a joke, he's really funny and always helpful. The reception staff offered for us to stay for another free lunch if we wanted it while we were checking out at noon, wasn't expecting that, we declined as we had things to do. The only good thing was the location. Rooms were quiet big and the view is nice. But I cant say anything else more. Just dont go to the Fiesta M hotel. Would not recommend. The beach is well appointed and cleaned in the evening. Quiet area without disturbing music. Clean and spacious rooms. Very good food with at least four main courses. 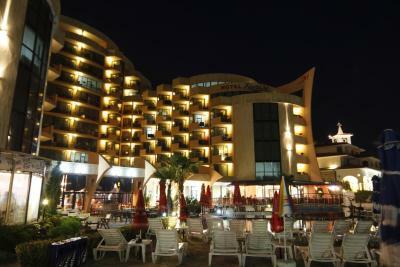 The location of the hotel is perfect, but one of the last hotels in sunny beach. The cleaners were good especially Habibe.The staffs were friendly even though they couldn't do anything about soo many complaints from the customers. Fiesta M Hotel - All Inclusive This rating is a reflection of how the property compares to the industry standard when it comes to price, facilities and services available. It's based on a self-evaluation by the property. Use this rating to help choose your stay! 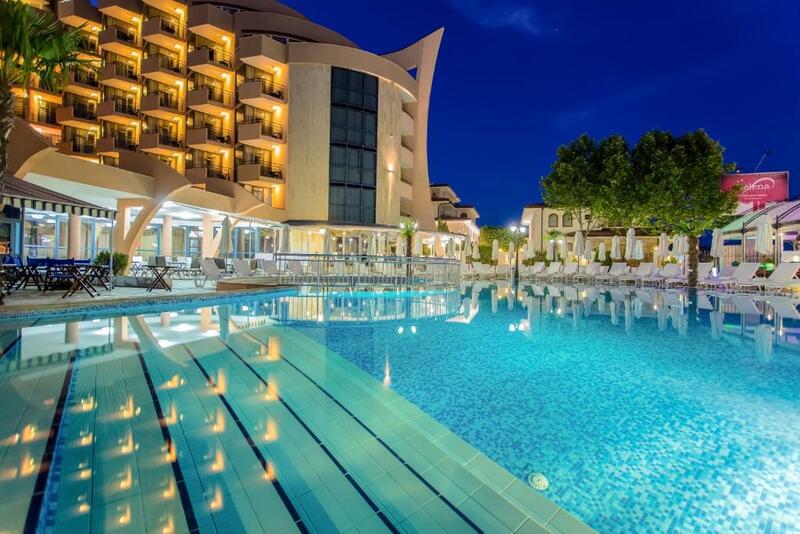 Enjoying a quiet and pleasant location in the immediate vicinity of the Black Sea and the Balkan Mountains in front of the beach, Fiesta M Hotel is perfect for families and friends. 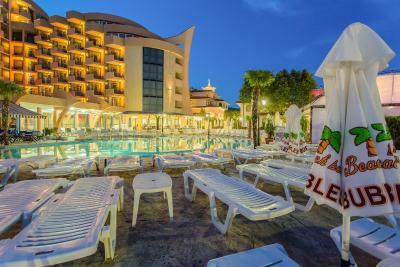 The modern property is located in the northern part of Sunny Beach, only a short walk from the bustling resort center. The Fiesta M is separated from the beach only by the sea promenade, where you can visit bars, shops and many other attractions. For your convenience, the hotel also offers a pool bar, a children’s pool section and a 24-hour reception service. The harmonious atmosphere of the Fiesta will add to an unforgettable holiday experience. The lobby bar is the perfect location for relaxing after a long day in the sun, while at the pool bar you can enjoy the beautiful sea view, fresh air and lots of sunshine. 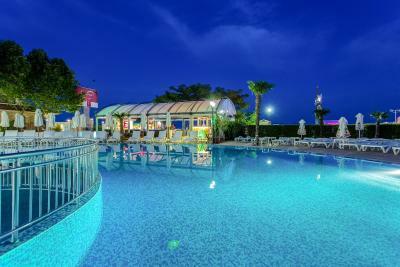 This is our guests' favorite part of Sunny Beach, according to independent reviews. When would you like to stay at Fiesta M Hotel - All Inclusive? Air-conditioned room with cable TV and a park-view balcony. Please note that safe is available at an extra charge. Air-conditioned room with cable TV and a sea-view balcony. Air-conditioned suite with cable TV, a seating area with sofa bed and a sea-view balcony. This twin/double room features a balcony, mini-bar and cable TV. This suite has a balcony, cable TV and mini-bar. This suite features a balcony, mini-bar and air conditioning. 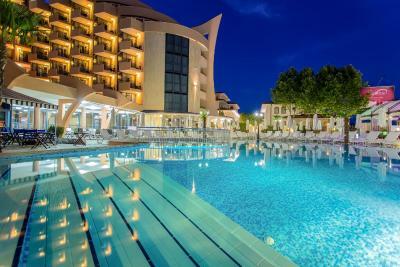 Hotel "Fiesta M ****" is located on the west side of Sunny Beach, just in front of the beach, a short walk from the busy center of the resort, in a quiet, romantic area between the Blak Sea Coast and the Balkan Mountains.Our hotel is the ideal place for families and friends. The harmonius atmosphere of our brand new hotel exudes charm that makes your holiday an unforgettable expirience. House Rules Fiesta M Hotel - All Inclusive takes special requests – add in the next step! For reservations made without credit card a deposit via bank transfer is required. The property will contact you with bank details information and terms of payment. Please note that late late check-out is available upon request and at a surcharge. A lot of the breakfast food was cold, but they had a microwave so managed to heat up my plate of food in a few minutes which was okay in the end. Cold runny eggs isn't a nice thing, so please invest in some burners to keep the food hot! Literally no one can speak English. We were eating the same food every day, breakfast,lunch,dinner. No other options available AT ALL. We asked for the manager, staff said the manager doesnt know english, then we found out that the manager is nlt even in the hotel! So we complained to the staff in the kitchen, and the response we've got was 'F*ck you' amd then apologizing to us with a champagne waiting for us in the room. Dont even want to talk about the bar, when I asked for a cocktail the guy(Denis) who works behind the bar was looking at me like I am stupid and said there is no cocktail. Then after Ive seen cocktails in others people hands I was going back and SOMEHOW he said that if I want a cocktail I have to say 'mixt'. By mistake we poured out a bit of beer in the lounge and when asked for the cleaner she was coming swearing at us bulgarian. Room service is same horrible. Left there our bin, towels not changed, just some of them. About the swimming pool. You dont want to see, there was so much rubbish after a windy night and not cleaned at all. Waitresses dancing around like they are drunk, just one of them speakkng english, recesption the same! So all in all: HORRIBLE and WASTE OF MONEY. Came to Evrika beach club hotel after, and its TOTALLY DIFFERENT!! Staff dont know any english. He's expecting a lot at the reception for information. Hotel staff do not know English well. There are not many parking places, but it can be parked in other hotels' parking lots for a fee. Food was awful and the bathroom smelled like a public toilet. Nobody speaks english. The food was poor. It is 4star hotel but we were served unknown and unlabeled alcoholic and non-alcoholic beverages. They had only cheap plastic cups. Only one bar for the whole hotel and the man serving behind the bar was an unprofessional teenager. The location was great. Rooms were big. The food..the employees don t speak english..small pool..bad drinks in the lobby. The cleaning of the room was not good at all and the room was not exactly the same as on the pictures. The hotel is divided in two with an other hotel, so you have to share the lift and the swimming pool with guests of an other hotel. There were not many choices for eating, most often the same to eat and not very good.. The personal of the hotel does not speak english only bulgare, so we didn't understood what they said, only in the reception they speak a little bit english and they are not very friendly. At the beach they don't have deck chairs. You have to pay extra for billiard. Food was a problem for me. Customer service is really bad (trying to be nice but all the requests are being declined). You are not able to pay with cards, they take only cash. You get launch in the last day only if you ask, otherwise you don’t. They were promising some food breaks but they didn’t gave anything. I liked it all ....it was exactly as I would expect an all inclusive hotel to be .